Installation Methods and Pan Tilt Zoom controls for CCTV and HD PTZ cameras. Not long ago, the only way to operate PTZ cameras was via a PTZ controller joystick that was hard wired to the camera. Installers were required to run additional cable to communicate PTZ commands via RS-485 or RS-232 protocols. The RS-485 or RS-232 cable was required in addition to the coaxial cable (for video) and power cable. 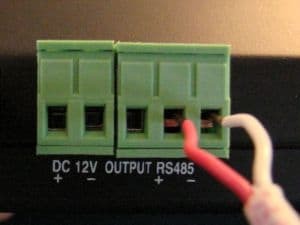 RS-485 requires a pair of cable and is still a very popular installation method. Although RS-485 is still very reliable, UTC technology was recently introduced. UTC technology (Up the Coax) allows PTZ commands to be sent over the same coaxial cable as the camera's video signal. UTC is also known as PTZ over coax. In addition to controlling PTZ directly on a DVR or using an external joystick, most modern DVRs support the ability to remotely control pan tilt zoom cameras using desktop software for Mac and Windows and / or via mobile apps for iPhone and Android. This article will discuss these various methods of PTZ camera installation and controls. Some of the latest model CCTV and HD-CCTV PTZ cameras now support the ability to communicate PTZ protocol commands and video over the same coaxial cable. This is known as UTC - "up the coax". This 1080p AHD PTZ camera (pictured in the below diagram) supports UTC with iDVR-PRO DVRs. This is how to wire a UTC compatible PTZ to a DVR. In this example, we are using an iDVR-PRO hybrid DVR that supports analog CCTV, AHD, and TVI type security cameras. Blue Wire - RG59 coax cable is run from the PTZ camera to a video input on the DVR. Red Wire - Power cable, typically 18/2 stranded power wire is run from the camera to a multi-camera power supply box or the single camera power transformer that is supplied with the camera. *Please note that installers can use RG59 Siamese cable which contains both RG59 coax and 18/2 power cable to run both power and video / UTC cables. Green Wire - Optionally, the DVR is connected to a router / Internet connection using CAT-5e cable if the user wants to enable remote viewing and control via desktop software and mobile apps. If you want to control a PTZ camera using a DVR and the DVR or camera does not support UTC, you can run an additional pair of cable to communicate pan tilt zoom commands via RS-485. This is how to wire a PTZ to a DVR using RS-485. In this example, we are using the same iDVR-PRO hybrid DVR as in the UTC example above. Red Wire - Power cable, typically 18/2 stranded power wire is run from the camera to a power supply box or the single power transformer that is supplied with the camera. *Please note that installers can use RG59 Siamese cable which contains both RG59 coax and 18/2 power cable to run both power and video / UTC cables. Orange Wire - 18/2 power wire is used for the RS-485 communication. Installers can also use a single twisted pair of wire from CAT-5 cable instead of power cable. This is what the RS-485 input looks like on the back of a DVR. Green Wire - Again this is Optional. The DVR may be connected to a router / Internet connection if the user wants to enable remote viewing and control via desktop software and mobile apps included with the DVR. This diagram shows how to wire a PTZ camera to a joystick controller for RS-485 communication. The installation is the same as the above RS-485 to DVR installation, except the two wires used for RS-485 are run to the joystick instead of the DVR. Please note that if you run the controls to a joystick instead of a DVR, you will not be able to remotely control the PTZ camera using remote DVR viewer software or mobile apps. This is how to wire a PTZ to a joystick for RS-485 communication. Orange Wire - 18/2 power wire or a single twisted pair of wire in a CAT-5 cable connects the PTZ camera to the joystick for RS-485 communication. Users can control PTZ cameras from most DVRs using on-screen controls. This is a screenshot of the PTZ control screen on an iDVR-PRO surveillance DVR. The PTZ-AHD-5 is wired to the DVR via UTC. The camera is being controlled directly on the DVR by clicking on the controls using a USB mouse. This screenshot shows that the screen looks like on the HDMI monitor that is connected directly to the DVR. Please click on the image to see the full 1080p resolution image. You can see pan tilt zoom controls on the lower part of the screen. There is also pre-set locations and options to setup a scan to tour pre-set locations on the left. When an iDVR-PRO is properly connected to a network router, users can view their PTZ camera remotely and control the PTZ functions in the iDVR-Pro Remote Viewer App for iPhone app. You can see the PTZ and pre-set function on the right, and the zoom in / out and focus functions on the left. Please click on the image to see a higher resolution photo. Please click on the image to see a higher resolution photo. In addition to iOS, users can also view their PTZ camera remotely and control the PTZ functions from Android apps. The above screenshot shows the iDVR-PRO Remote Viewer App for Android controlling a 1080p HD resolution AHD-PTZ-5. The AHD-PTZ-5 is connected to the iDVR-PRO via RG59 coax cable. UTC is used for the PTZ communications. You can see the pan, tilt, zoom functions on the right, and the zoom in / out and focus functions on the left.